Sidney Marsh, born a Mississippi girl, but moved to the Big Apple- where she is now a travel agent for Itchy Feet Travel (don’t blame Sidney- she didn’t pick the name!) Sidney likes her work and loves her friend, Jay, who is a fun friend at the travel agency. One day Sidney walks in Itchy Feet late, and realizes the normal decor is gone and everything is different- more African safari like decorations. Turns out as she walks in the meeting, that this is the owner’s plan- safari’s for the groups as a way to drum up new business. Sidney and Jay get chosen to go on a “fam trip” to Africa (to familarize themselves with what to expect before they take a group on a safari). After the debacle of the last trip that Sidney and Jay were on- it’s made clear to both of them that this trip to Africa needs to go smoothly. Of course, best laid plans and all- the trip to Africa starts out ok; but slowly begins to disintegrate. Jay’s nervous about the animals, Sidney’s pocket gets picked, and one of the travel agents has a terrible habit of making everyone wait! As Sidney listens and learns more about each travel agent- she becomes suspicious that someone on the “fam trip” is an imposter. Still, for the most part, Jay and Sidney are happy on the trip- until a body is found. Was it an accident? Did one of the animals attack? Or was it something more sinister? The “fam trip” continues, but Sidney and Jay are growing more suspicious as the days go by- and they aren’t the only ones. Before this trip is over, more things will have went wrong, true identities will be revealed, and Sidney will learn that in Africa- it’s not only the wild animals that need to be feared- sometimes the humans are the most dangerous. With danger, intrigue, romance, and more- Sidney Marsh takes the readers on a ride that is fun and interesting! Blogger’s opinion: This is my first Marie Moore book, and I found the story enjoyable. The story flowed fairly well for the most part. Sidney is an interesting character, and I liked the character Jay. With it being a book that had a travel angle- I did expect some travel agent talk; and while some was needed- perhaps it had just a bit too much. However, the book has more positive than negative about it. I do believe that I’ll be checking out the first book in the Sidney Marsh series- and look forward to reading more about Sidney. *BIG HUGE GIVEAWAY! Cozy Mystery Reviews is offering a GREAT giveaway! Details HERE! Melanie, so happy that Sidney and Game Drive could Travel with T! Thank you so much, and I hope you and your readers will come along with us on all Sidney’s adventures. This is the second book in the series. In the first one, Shore Excursion, Sidney and Jay are on a cruise leading a group of senior citizens called The High Steppers through Scandinavia to Russia. Everything’s going great, until one of them turns up dead and it’s up to Sidney to solve the mystery. Thanks for inviting us to Travel with T! Enjoyed Game Drive! 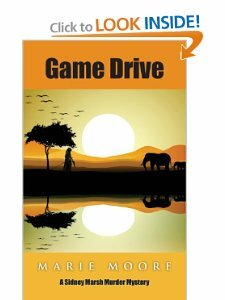 Was glad to be a part of Cozy Mystery Reviews GAME DRIVE blog tour. Looking forward to reading Sidney and Jay’s first adventure (Shore Excursion) and hope to read more.